1. This picture of Yogi Bear. 2. Also this other picture of Yogi. 3. This picture of fat Scooby-Doo. I wish he was real. 4. This picture of Huckleberry Hound looking at you. 5. I like the way his eyes always droop a little. It feels like I hate him but I'm always looking at pictures of him. 6. This picture of Snagglepuss. 7. This picture of Snagglepuss where you can see the bottom of his paw. 8. 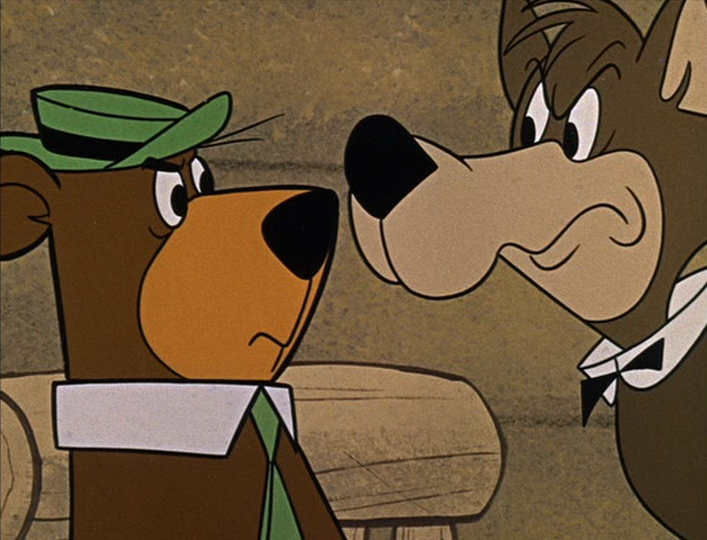 This picture of Hokey Wolf really close to Yogi's face like they're going to kiss. I don't want them to kiss though!! 9. This picture of Hokey whispering to Huckleberry Hound. He looks so tall in this picture. 10. This picture of Wally Gator. 11. This picture of Choo Choo. 12. This picture of Lippy the Lion. 13. This picture of muscular Hong Kong Phooey. I got in trouble at work for looking at this picture. 14. I've never had a crush before.